I feel a measure of apprehension when given a review copy of a book which falls outside of my usual range of choice. 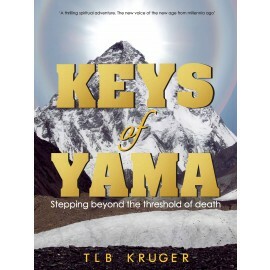 Keys of Yama by TLB Kruger fell into this category. However we all know that good things happen when we step outside our comfort zone. At times while reading Keys of Yama, I was reminded of Sophie’s World, listed as one of the top 100 books of the century by BBC / Waterstone. In Sophie’s World the plot line was little more than a means to present the theories of key philosophers through history. In the Keys of Yama, the plot is stronger but also a device through which key principles of Buddhism and Tantra are presented. I fell under the impression that the book came into being through a desire to use the vehicle of story telling to expand understanding in this regard. Tjaart Kruger and I got off on a bad foot, when the opening poem used the same word to rhyme. I believe that Keys of Yama is the first book in a trilogy, that said the book rounded off well not leaving frustrating loose ends and can stand alone. It left only the desire to know more of the characters and what lies ahead for them. I shall be handing my copy to my aunt Sandy who is a Buddhist.